We are taking a year-end break from Tuesday Teasers. Teasers resume in January. We had the Northern Shrike at 10:50 this morning — great views by the retention pond across Disposal Road from the Carillon. We were in a vehicle across the road from the retention pond, and the bird flew in and perched in the tree above for about 30 seconds (above). It then hung out on a nearby strand of barbed wire, dipped down into the tree behind the barbed wire, then flew across the pond and disappeared from view. We also had a male Northern Harrier fly overhead almost simultaneously. If you are planning to look for the shrike, birding from your vehicle does not seem to be a bad approach. You are out of the wind, and the bird seems oblivious to vehicles. This is the 10th day out of the past 12 that the bird has been seen. Click "Continue reading …" for more shrike shots from this morning, including a "locating the bird" shot and a neat tailfeathers shot. 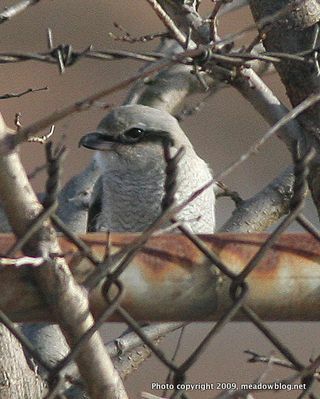 Scroll down the blog for earlier Shrike posts. "Botha's Boots," a blog out of Brooklyn about "music, architecture and the stuff in between," had a post yesterday about our favorite place: the Meadowlands.